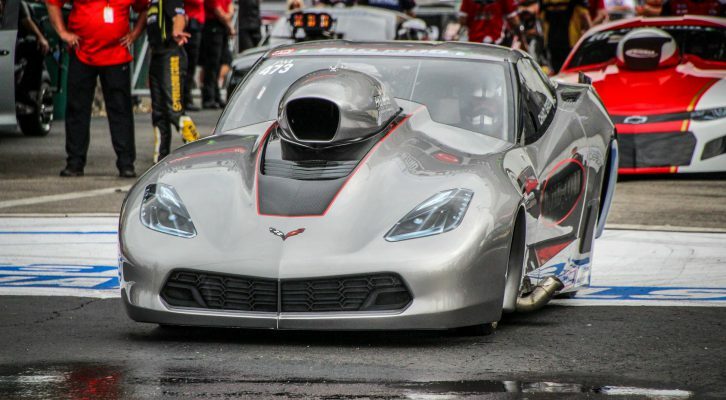 ENNIS, Texas – Chad Green’s first season in the E3 Spark Plugs NHRA Pro Mod Drag Racing Series presented by J&A Service has already surpassed expectations, but the rookie standout is hungry for more to close his 2018 season. The Midland, Texas native will get that chance as part of this weekend’s 33rd annual AAA Texas NHRA FallNationals at Texas Motorplex, as the class makes its first appearance at the track in 10 years. It’s one more exciting aspect of the race for Green, who currently sits fifth in points in the loaded class after his second final round appearance of the season at the most recent race in St. Louis. It’s the latest impressive race for Green, who hopes to keep the strong momentum going. The race, which is presented by Bruce Lowrie Chevrolet, is the 10th of 12 events during the 2018 E3 Spark Plugs NHRA Pro Mod Drag Racing Series season and will be shown on Fox Sports 1 (FS1) and Fox Sports 2 (FS2). Mike Janis took the points lead in the class in St. Louis and leads three-time world champion Rickie Smith by 46 points. Stevie “Fast” Jackson, who has won back-to-back races follows in third, while Green is just 27 points back of fourth-place Mike Castellana and just 49 points behind Jackson. 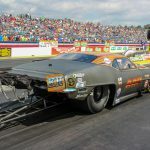 Plenty of standout competitors are behind Green, but he is looking up as his nitrous-powered Bond-Coat, Inc. Chevrolet Corvette continues to make consistent runs. After advancing to the semifinals in his debut race, Green has followed it with final-round appearances in Topeka and St. Louis. He would love for his first win to come at his home track, but Green knows it won’t be easy. St. Louis was home to the quickest qualifying field in E3 Spark Plugs NHRA Pro Mod Drag Racing Series history, with Green’s strong run of 5.756 at 248.80 mph only qualifying him 12th. But he knocked off former world champion Khalid AlBalooshi, Castellana and perennial top 10 driver Danny Rowe to reach the final, giving him confidence for Dallas. But Green knows he’ll have to keep performing on a high level in a class that continues to impress. 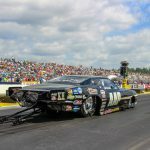 Bruce Lowrie Chevrolet is the presenting sponsor for the E3 Spark Plugs NHRA Pro Mod Drag Racing Series race in Dallas, as the class has just three races remaining in its highly-competitive 2018 season. 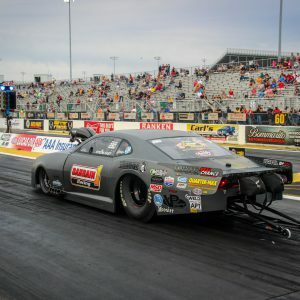 Featuring the world’s fastest doorslammer race cars, the E3 Spark Plugs NHRA Pro Mod Drag Racing Series presented by J&A Service offers something for every kind of hot-rodding enthusiast. The class is highlighted by historic muscle cars, like ’67 Mustangs, ’68 Firebirds and ’69 Camaros, as well as a variety of late model American muscle cars. Located at 711 SW Loop 820 at the Hemphill Exit in Forth Worth, Bruce Lowrie Chevrolet has been in operation for nearly 100 years, offering a large new and preowned sales, service, parts and collision centers. The Chevrolet dealership has also been a longtime supporter of Texas Motorplex. Green and his nitrous-powered 2018 Corvette will also be appearing for pictures and autographs at the dealership from 3-5 p.m. on Wed., Oct. 3. The all-new 2019 Chevy Silverado will be on display, while it also makes for an exciting opportunity for Green at his home race. The first of four E3 Spark Plugs NHRA Pro Mod Drag Racing Series presented by J&A Servicequalifying sessions takes place at 12:45 and 5:00 p.m. on Friday, Oct. 5, and the final two rounds of qualifying take place on Saturday, Oct. 6, at 12:30 and 4:00 p.m. Final eliminations are scheduled for 12:10 p.m. on Sunday, Oct. 7. To purchase general-admission or reserved seats, call 800-668-6775. Tickets also are available online at www.texasmotorplex.com. Kids 12 and under are free in general admission areas with a paid adult. To honor the Salute to First Responders, military and first responders save 20 percent on general admission tickets at the gate. 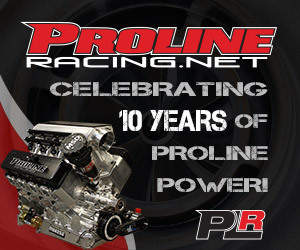 For more info about the NHRA visit www.NHRA.com. Family owned and operated, Bruce Lowrie Chevrolet has been a staple of Ft. Worth since 1922 and is one of the oldest Chevrolet Dealerships in the state. Located at 711 SW Loop 820 at the Hemphill Exit, has one of the largest new and pre-owned sales, service, parts and collision centers in the area. Bruce Lowrie Chevrolet is heavily involved in area community events, supporting the Texas Motorplex, the Lockheed Martin Armed Forces Bowl, churches, schools and the Ft. Worth Police and Fire Departments, to name just a few. Come see all our beautiful cars in person and we’re always open online at www.brucelowrie.com.